When it comes to discussions about ageing society, Martti Ahtisaari, former President of Finland and Nobel Peace Prize Laureate, notes that we tend to focus on the financial burden caused by an increasing number of older people. Ahtisaari recently shared his thoughts on the topic at NORIS, the Nordic Risk and Insurance Summit of Swiss Re in Reykjavik. No doubt, these costs will be enormous but we also have to keep in mind that the younger generation has the potential to help take on the challenge. No generation before has had the same potential to manage this challenge so productively. No generation before has had access to such good education, has (mostly) lived in such good economic conditions or is so open-minded and flexible. However, to foster intergenerational equity, intergenerational cooperation and solidarity are required. Both sides need to contribute: We need a new retirement model allowing active older people to work longer and we have to make sure that the younger generation is able effectively contribute to society. Against the backdrop of a difficult economic situation and an unacceptably high unemployment rate among the youth in many countries a key question will be: How can we effectively involve young people in the constructive development of our society? It was fascinating to discuss with our clients how the insurance industry can help society meet the challenges of a changing economic and demographic framework. As an industry we need continue to work together to help society become more resilient. 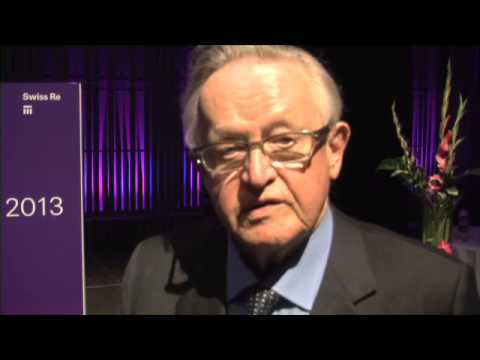 Tags: #Generations, #Insurance industry, #Video, #Martti Ahtisaari, #NORIS, #Intergenerational equity. Alicia Montoya - 29 Aug 2013, 9:21 p.m.
Mass youth unemployment is something that has me seriously worried. I'm from Spain where a whole generation of youth in their 20s have gone into their 30s without ever having worked. Even scarier, European birth rates are falling dramatically. So, as this article points out: "Mass youth unemployment is caused not by a surfeit of young people but by demand for their labour now declining even faster than their numbers are falling. And part of the reason that demand is falling is that the numbers of young Europeans are falling so rapidly. There are far fewer young consumers than there used to be, and very soon there will far fewer again, each with less to spend on services, work often provided by other young adults." Gavin Montgomery - 30 Aug 2013, 7:16 a.m.
Those are still shocking numbers but they are dwarfed by the extent of the problem in Europe. It is fairly obvious that what is happening in countries like Spain, Portugal or Greece is disproportionate even in the context of the economic downturn in those countries. Instead, it reflects that those economies are deeply uncompetitive, shackled to a massively over-valued currency which makes their goods and services unaffordable with an economy that has been artificially distorted by EU investment programs and misaligned priorities towards a future that never materialized. Spain built amazing infrastructure in Andalucia, for example, making it possible to commute between rural villages producing dust and dung on high speed trains which have been extremely profitable for the operating companies because of tourism but have done nothing to spur industry. Paul Krugman touches on Europe's woes in today's New York Times - http://www.nytimes.com/2013/08/30/opinion/krugman-the-unsaved-world.html?hp - and comes to the usual conclusion: excessively rigid austerity programs and the euro mean that peripheral European states are stuck in a poverty trap that is likely to weigh them down for decades.